Bob wrote yesterday to ask for a “No. 622 Soap Holder with Crystal Tray…Over the years the Crystal Tray got broken and the plating in the soap dish is pitted and in bad shape….” This question comes up a lot. Here are some ideas. Watch for vintage. First of all, if you keep your eyes peeled and can be patient, there is new old stock out there. 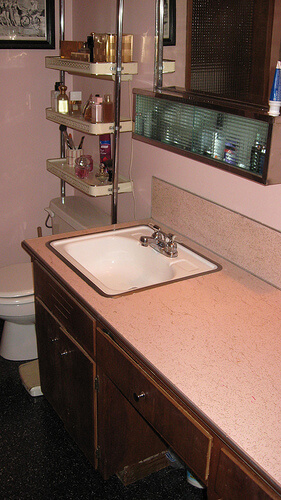 A favorite new source: Anderson’s Classic Plumbing. Joy, who’s in the family and handles internet sales, recently contacted me. She found a major stash and is slowly but surely listing it on their site. The image above is from Joy’s stock – gorgeous. 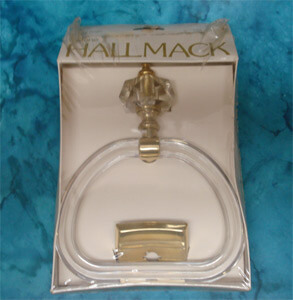 Also watch ebay — there’s usually always some vintage Hall-Mack of some sort listed at any given time. Replace the whole thing altogether — Franklin Brass offers recessed soap and tumbler holders in both stainless steel (no rust!) and chrome. They look to have acrylic liners. As for glass: No known source that I know of. But if we find one, we will add it. UPDATE: Larson Supply Catalog recommended by Lauren; I need to study. I think I may have posted a link about the lil lucite tray replacements a few months back, but I’m not sure. I did find this catelog by the Larson Supply Co.* which MAY have things people need, but more research would have to be done to confirm it. As it turns out, I need a replacement plastic tray for my recessed chrome soap holder, too.. so it will be helpful to know where to buy when I’m ready. I know that here in Sacramento there’s a great place called Mac The Antique Plumber, and though it would be hit or miss- one could call and ask if he has those lil trays. I seem to recall him saying once that he might have some stowed away somewhere…. We now have the 622 size and the smaller on also. We had the mold made for the small one. 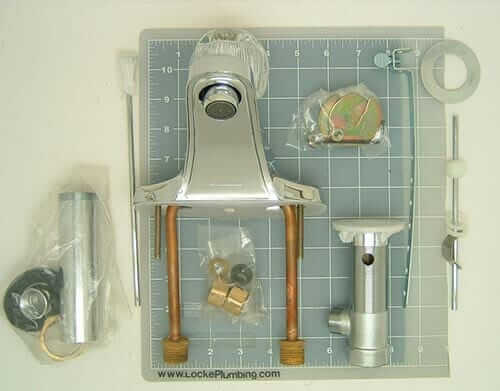 Look in Plumbing dept, Bathroom Accessories, Repair parts. We have them each or by the 5 or 25 pack!